When your existing gutters give you trouble, your first call should be to Muth & Company Roofing. We offer complete repair of gutters in Columbus, OH, services which can range from replacement or redirection of certain sections of gutters and downspouts to patching small holes with sealer. If necessary due to disrepair or rust, we can also replace the entire gutter system. We would be happy to inspect your gutters at no charge, and give you an estimate for gutter repair. Gutters sag and leak when left unattended for long periods of time, giving your home an unkempt look. Worse, gutter problems can threaten its structural integrity. Gutters which are clogged with leaves and debris force water to overflow and pool around your home’s foundation, a serious problem that may result in basement flooding and even a cracked foundation. Other areas that are affected by improperly functioning gutters are soffit and fascia, siding, landscaping and even the interior walls. Standing water inside gutters that are improperly pitched makes your home a hot spot for mosquitoes and other pests to multiply. Prevent more serious threats to your home’s integrity by keeping your gutters in good repair. Here are some of the most common repairs we make to gutters in Columbus, OH. Muth & Company Roofing can install sturdy, effective Leaf Relief® gutter protection to keep leaves and debris out of gutters. This will extend the life of your gutters and eliminate the inconvenience of having to clean your gutters frequently. Especially if you have trees nearby, gutter protection is a wise investment that keeps water in its place, flowing safely away from your home. 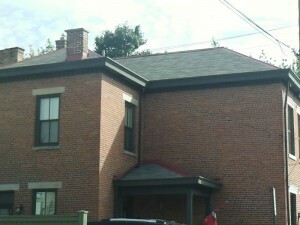 Call Muth & Company Roofing today at (614) 882-0900 to arrange for a FREE estimate on Columbus gutter repair. Or simply fill out the form to the right and type “gutters” in the message box, and we’ll contact you within one business day to schedule an appointment. Click for more information about our service areas of Columbus, Westerville, Dublin, Bexley, Delaware, Worthington, Gahanna, New Albany and nearby communities in Ohio.